When Laura Ingalls Wilder began writing the series of books chronicling her life, she had no way of knowing the tremendous popularity these books would enjoy. Fondly referred to as The Little House books, the stories of Laura's experience homesteading in the American West have endured through the decades and continue to hold a place dear in the hearts of American readers. The books have been immortalized in film, television and musical theatre. But Laura Ingalls Wilder's life is significant in other ways. In addition to recording her experiences homesteading in America, Wilder was also an advocate for farmers in the early 20th century. She served as both columnist and editor of the Missouri Ruralist and had a paid position with the Farm Loan Association, giving loans to local farmers. She advocated not only for farmers, but took an interest in the opportunities for women that were beginning to be available at the time. 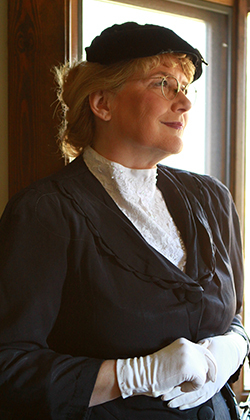 In fact, Laura Ingalls Wilder personifies the very heart of the American experience in the early 20th century. From covered wagons as a child to modern airplanes as an older woman, Wilder's life journeys truly reflect the journey of the American consciousness. Karen brings to life this beloved writer. Portraying the character in the 1950's, as Laura looks back upon the journeys of her life, Karen will recount not only some stories of Laura's childhood, but also how the books came to be written. She will tell of Laura's 64 year marriage to Almanzo Wilder. And she will address the controversy surrounding Laura's daughter, Rose Wilder Lane's involvement in writing the iconic books. Laura Ingalls Wilder has left an important legacy to America. Not only did she create a beloved series of books that has encouraged young people to appreciate literature, but she has chronicled the American West and the experience of the frontier. Her stories capture the heart of what it was like to actually live in a time and a place that is long past.